Yeah yeah, it’s another Arashi post. It shouldn’t be a surprise anymore. They are five very different personalities. They may be in a group but they are also one another’s biggest rivals in the industry as actors and endorsers (not to mention those endless surveys that love to pit them against each other). Just how different are they? Riida prefers to be left alone. Sho is the OC type. Aiba is the happy-go-lucky one. Nino is the snark. And Jun is like an M&M, hard on the outside, soft inside. How they managed to stay together and go from strength to strength in the last 15 years and counting–not to count their junior years–despite those two reasons is why I love this group so much. We have heard of stories on how it was only Jun and Aiba who seemed enthusiastic to finally be able to debut in 1999. We know how Nino and Sho were trying to quit and break away from the group even before they started. And how Ohno, who will become their leader, didn’t think they’d go far. Perfect recipe for failure, if you ask me. In fact, the reason why most people love Arashi is because of the group dynamics. Yes, they are five different people who may not have been friends had they not been thrown into a group together. Despite that, they managed not to fight since they were formed. I’m sure they have disagreed with each other time and again, considering their different personalities but we can take lessons on tolerance and loyal opposition from them. I have heard of their rule that when it’s mealtime, they always form a circle to eat together, no matter if someone is in a foul mood. They may be guys who don’t have to deal with PMS monthly and I’m sure they have different ways of handling things but hey, other male groups have had public fallouts and we know where that ended. Though they are one group, Japan’s top no less, they are pitted against one another just because the media find it interesting and perhaps they’re hoping to find chinks in the Arashi armor. And when you’re rivals, it’s easy to just be selfish and try to take the limelight for yourself. But what I see in Arashi is a give and take culture. And it couldn’t be more obvious now as Riida and Nino appear in different dramas this season, with the group releasing two singles. Considering that the dramas are airing in rival networks, the promotions will also have to be separate. It could be a sensitive matter but one never feels the tension within the group. No drama–and it helps that this is a happy fandom–with only positive energy and the members themselves lead by showing. So you see Sho blatantly promoting Nino’s NTV drama on VS ARASHI, which airs on the rival Fuji network. 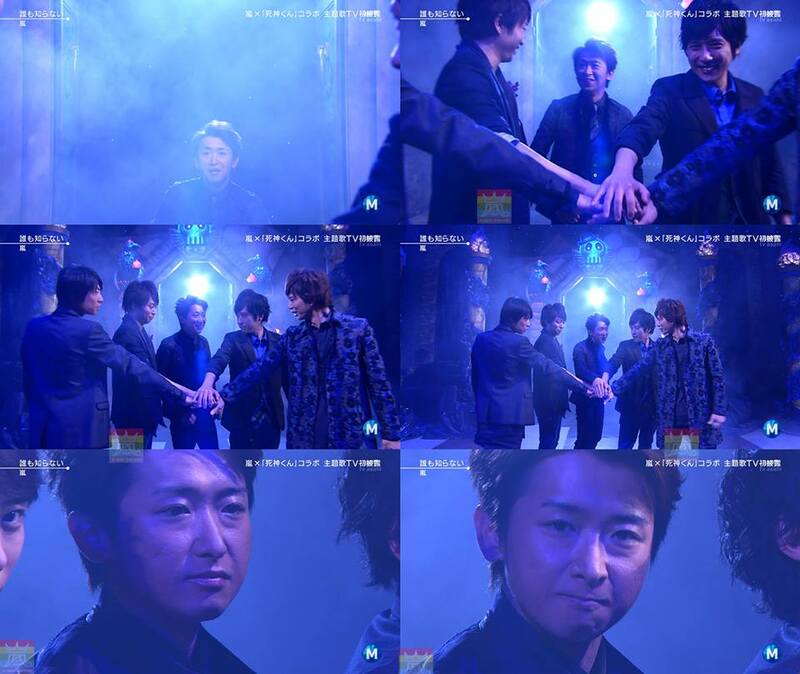 And the members letting their Riida shine when it’s his turn to promote his drama and single on MUSIC STATION on TV Asahi. But what else can we expect? These guys have been together for more than 15 years, they have perfected the dynamics that is Arashi. And it’s not only this time that their selflessness for the sake of Arashi or the members is apparent. It happens every time they promote a member’s individual work either on their shows or in other shows, and on how they let the limelight shine on that member. They are also unabashed in their support and affection for one another. How many times have we heard members talking about another’s individual work? Like how Jun watches Sho’s News Zero newscast every Monday (and records the members’ dramas). Or how Riida sends messages after watching the others’ dramas? Or Sho telling a colleague to take care of Aiba in another show. Then there’s Aiba receiving messages of support on a live show from the members. Even how Nino gets embarrassed watching SHITSUREN CHOCOLATIER (don’t worry Neen, you’re not alone lol)? They don’t begrudge one another of the success they enjoy individually and a huge factor is also how the fandom, despite differences in opinion sometimes, throws its support behind each member. Had it been any other group, they would have gone separate ways. Sho can just focus on being a newscaster-idol. Jun could have struck out on his own after HYD. Same with Nino after he went to Hollywood. Aiba can concentrate on being variety show host. And Riida can just go fishing and do his art as much as he wants. But the fact of the matter is, they do get to do their own thing, but without turning their backs on the group. Even when they’re doing individual projects, it reflects back on Arashi. While for others it may be a burden getting away from the shadow of their group, they treat it as an advantage and acknowledge the fact that they won’t be able to pursue individual interests if not for Arashi. And I think this is why we see so much energy from them. Because while they function as a group, they are able to express themselves individually. And thus, are able to bring many things back to the group from their individual experiences making Arashi very organic. It also helps that each member understands and accepts his role in the group, whether they have talked about it (in one of those brainstorming sessions they used to do during their low years) or not. They also know what each others’ weaknesses and strengths are and work around them. Which other group has a choreographer, rapper, merchandise director, musical director and concert director as members? Not to say they don’t need other staff but they have so much skills and talent among their ranks that they are able to make use of with no one dominating. Looking at them and how they obviously enjoy doing things together, it teaches us that no matter how other people may think differently from us, you can get along too if you give it a try. Though maybe it won’t work all the time. After all, as Arashi members said at different times, theirs is a different case. There is only one like them and had one member been different, it would obviously not be the Arashi that we know. The boys never cease to amaze me. I hate working in groups, especially if I’m in it with people other people chose for me. I take my hat off to them. I don’t think I’ve ever heard of them having a huge fight (or maybe I’m just not a good enough fangirl, who knows). I love NEWS and it broke my heart when they went on hiatus. Here’s hoping that the Arashi kingdom stays strong forever and ever! With my everyday life I get so few chances to see a glimpse of Arashi (except for the dramas that I refuse to miss) and I always love to read about them. Mmmm… I’m just sinking back into my couch with agreement at everything in this post. Just, wow. Arashi members are perhaps the most selfless ones in any group. Gonin de Arashi! There’s no ONE standout star. I’ve always gotten the feeling that in the early days, when Jun was taking most of the spotlight due to his breakout role as Domyouji, he was actually more embarrassed than pleased at all the attention. The other members loved to accentuate him in Shukudai-kun, calling him the “popular one” and they would playfully thank him for “giving them work” by appearing in the dramaduring their secret talks and interviews, but Jun always seemed to be a bit uncomfortable to me when they did that. It was as if he felt that it was wrong to be hogging all the spotlight. Of course, in the past few years, he’s loosened up considerably since all Arashi members have now become superstars in their own rights; I just thought it was heartwarming how considerate Jun was about the group dynamics within Arashi. And as you said, the same thing can be said of Nino during his journey to Hollywood. I was just saying in another comment that their difficult years must have left a deep psychological scar on Arashi. That’s why they don’t take their success and fame for granted and that may also the reason why they are tight as a group because they could only rely on one another during those times that even their own agency had little faith on them. And I’m glad they went through that because it only strengthened them as a group. I remember what Riida said in his 2012 letter on 24HRTV, telling the other members that they should always smile “as five always” no matter how difficult the road ahead. And yes, I also had that feeling that Jun felt uncomfortable when he was getting the attention during HYD and tried to deflect it always. and seeing them now, and how they are superstars in their own right, we can’t help but look back with pride at their struggles. remember that HYD skit they did in one of the Secret Talks (I think for Wish) and they bungled it up leading Riida to say “this is why they don’t ask us to be in dramas”. Well, look at them now, practically every drama season in Japan has an Arashi member. This season alone has two of them! thanks again for leaving such lovely comments here! “I have heard of their rule that when it’s mealtime, they always form a circle to eat together, no matter if someone is in a foul mood. ” – aww this almost made me tear up. I remember that comedian’s interview… and he also said that since he was working with Aiba the next day, Sho told him to take care of Aiba. I really think that it’s because they were forced to depend on one another after their debut since JE considered them low priority. they had no one but one another. and now that they have succeeded, it’s only also them who can understand what it’s like to have been through what they’ve been through and be where they are now. I remember Yoko asking I think it was Ohmiya on Sharehouse what it’s like to be where they are and neither of them could answer. It was Becky, who was the other guest, who said that Arashi won’t know because in the eye of the storm (pun not intended), it’s very calm and quiet. remember also how they talked about having so much fun with one another that sometimes they forget they have a guest on the show and the guest unwittingly feels left out? Jun once said it’s amazing how they never run out of things to talk about or never get tired of having fun together when they see each other almost everyday because of work. That paragraph! And the rivalry among members of the same group. I have/had seen it in other groups. The atmosphere was worse, and no clear support among themselves, even though they’re one unity. BUT, for Arashi, there’s nothing like that. People should know, they’re like that since long time ago, not only after big break! They’re alw tried to promote members project (very indirectly/only hint when they’re still no one, and now they’re shamelessly doing it even in different stations XDD). Alw tried to stand out members, not themselves. Arashi should be a model for pop idol groups… someone has written on how they could be a model for teamwork in companies. By model, I don’t mean others should emulate them because a large part depends on their temperament, personalities and chemistry. it just so happened that they are the right mix, they balance each other. but maybe other idol groups can learn how to give and take and work on their strengths both as a group and individuals, instead of trying to take the limelight from the others.